From the roof of the Community Board office! Lovely evening! Click on the picture for a nicer view as usual. OK, the picture is silly but the comment is real. I pulled this bunch off of the banks of the Paerdegat tonight, with all the ribbons one of the shorebirds that frequent our basin could all to easily have become entangled and starved to death if not spotted in time. Animals will also sometimes eat deflated balloons (sea turtles in particular are known to mistake them for jellyfish, their favorite thing to eat), which can also kill them. I'll frequently pick up a piece of two of trash when I'm out paddling but it's pretty random whether I'll paddle past a piece of trash or stop and pick it up. Nothing random about getting this trap off the shore though - no way was I going to leave it there. Lovely paddle tonight. I think I launched around 7, it was a beautiful warm night and very quiet (especially in comparison to Tuesday's rollicking waves). I decided to mix it up a little bit tonight, last few paddles I've been heading for the inlet, tonight I hung a right and paddled to JFK airport and back. The light was gorgeous when I launched, had that "golden hour" thing going on; I actually didn't take my camera because it would've been one of those trips where I spent more time taking pictures than paddling and I still have more pictures from last weekend to go through before I make more. No skimmers tonight but plenty of oystercatchers and an osprey, and I can't speak to the cotton question but the fish were definitely jumpin', it seemed like I startled a school every few minutes. I saw lots of little fires along the shore, I wasn't the only one enjoying the beautiful evening. I decided to finish up with a loop up to the end of the Paerdegat and back, just to get in another mile - I don't usually do that but I was feeling energetic, and I'm glad I did because that's when I found the balloons. Somewhere around 13 miles all in all, and then perfect timing with both bus connections (and the first bus driver was nice enough to let me on at a stoplight - that was outstanding, I don't think they have to do that, and at that hour of night it would've been a long wait until the next one. By the time the women's race was over, the festival on the pier was well underway - all kinds of beautiful music and dance! Unfortunately I didn't get the names of the hālau or performers, but I did get a few nice pictures (and a little bit homesick - I wish I remembered any of the hula I learned when I was a kid)! If my friend Harry and I hadn't made plans to go for a fireboat ride later in the day, I might have just camped out here all day. As things worked out, I'm glad we did what we did 'cause it was a really nice ride on the Harvey - felt like WAY more than the allocated 45 minutes somehow, and on top of the standard harbor pictures, we went RIGHT PAST the 3rd outrigger race of the day, the 11-mile coed race. Fantastic seeing the wa'a out there in the harbor -- that nice shot of the outrigger at the Statue I posted a couple of days ago? That's when I got that, and of course more, which of course will appear here in due time. But first, here's the music and dance -- and behind the stage, lei-making and hula lessons for da keiki! Click on the first picture for a slide-show view. A good post-work paddle last night. Got there a little late and missed the launch of the official Tuesday night club paddle, and it was so windy I was having second thoughts about going out on my own, but a friend was there so I had a hand getting my heavy boat down to the dock, so that made me decide to go. Stayed close to shore since I was on my own; fought my way against a big headwind out to where I could see around the corner to the Marine Park Bridge - had sort of expected to find the Tuesday night paddle out there but when they weren't there I called it enough and headed for home. Wind and chop that I was bashing into going out of course turned into a terrific downwind run home with a nice surfable swell, whee, and then the Tuesday night paddlers were still in the clubhouse when I got back so I got a hand putting the Romany away and then hung out and had a beer and crackers with Tony Pignatello's fresh-ground almond butter. Yum. Seven and a half miles in energetic conditions, I slept well last night. 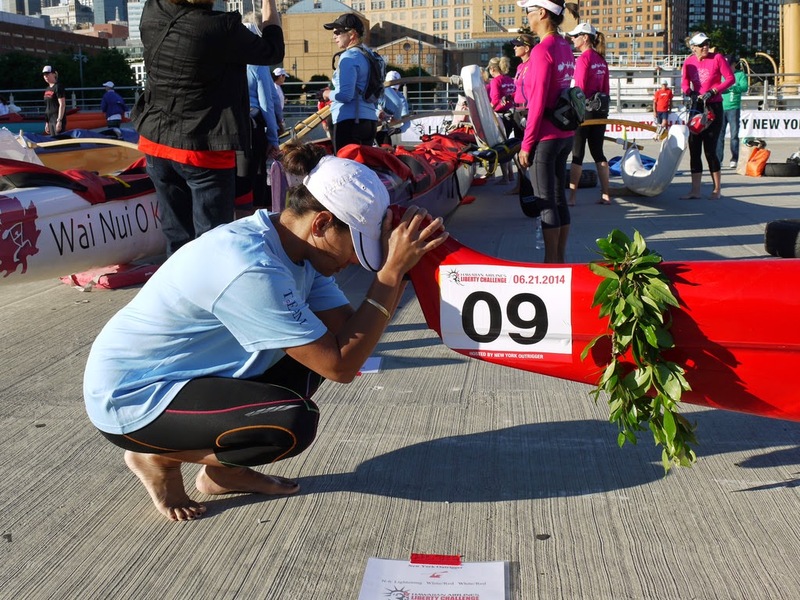 Member of Hawaiian Airlines Team Kokua readies herself for the race. I've posted more photos of the women's race on Flickr. Click here to view. Between the Liberty Challenge and rides on the fireboat John J. Harvey and schooner Pioneer, I had a wonderful weekend for picture-taking, so I'm splitting things up - more to come! OK, if I don't post about this now I'm never going to - we had an incredible All-Club Invitational and Pig Roast a few weeks ago at the end of May. It was WONDERFUL. We used to have an Open House around this time but with City of Water Day spreading from the original event located on Governor's Island to the all-borough blowout it is now, including an all-day public event at Sebago, we've decided that that's our open house. Better timing anyways, the water is still pretty cold in May and early June (especially after this year's winter) - by July, when "COW" day comes around, falling in the water, as sometimes happens to beginner paddlers, is not a bad thing at all. So instead, this year in Spring, we did an all-club invitational, revolving around a fabulous offer from Paddling Chef Steve Heinzerling - at some point he'd invested in a pig-roasting box, and at one of our planning meeting deep in the darkness of that terrible winter we had, he said something along the lines of, "Hey, I have this pig-roasting box, why don't I roast a pig?" And that's just what he did on May 31st, and it was SCRUMPTIOUS. There it is, just out of the roasting box. The event was billed as a luau. I did make something like a couple of gallons of disappointing haupia (Hawaiian coconut pudding, it's supposed to be fairly solid, mine came out soupy); sides of rice and beans and plantains were more Cuban than Hawaiian but there was so much aloha spirit at the club that day, it was OK (and besides real luau food is hard to get for a reasonable price in NYC). And the pig's head is in my freezer waiting to be made into pozole so I'm not going to get picky! We also had a LOVELY pre-pig paddle. It was a very windy day, only a small group of good paddlers decided to go for the race or the "long" paddle. Beginners were kept in the basin, but the nature of the all-club invitational is that it brings in paddlers with at least SOME experience. Few people being into "torture paddles", though, most of our guests decided to join in on the "medium" paddle, which was to Fresh Creek (first basin east of ours). I came along thinking it was going to be a so-so paddle, I'd been to Fresh Creek before and found it nothing to write home about, but either I went at a less green and lovely time of year, or the shoreline restoration I was later told has been going on there has been VERY effective, because it was much more lovely than I'd recalled. All in all, a wonderful day! Click HERE for Flickr album! Sorry, uncaptioned! So of course the sharks were a couple of the racers at the 2nd Annual Gowanus Challenge last Saturday! There wasn't the turnout this year that there was last year, but there was still a respectable field of racers, the weather was fine, and I think everybody had a good time. I forgot to bring my zoom lens for shots from the bridge, and for the first dozen shots or so I had my camera on a weird setting that turns everything greenish-blue, but despite all that, naturally I still came home with plenty! Click here to visit the Flickr set. It was just terrible. You knew they were trouble when they paddled up in their sleek sharkmobile with the sign that read, "We're gonna EAT the competion!". And then, after doing a sharky victory dance, they drank all the vodka, they ate the emcee, and then, as if that wasn't enough, they started in on terrorizing the children. Seriously. Sharks. You can't take them anywhere. Doing the weekend's events out of order for no particular reason - last night I stayed up past my bedtime putting together a Flickr album of photos from the canoe workshop. This was actually something of a joint effort, I didn't want to be worrying about the camera while I was trying my hand at sailing a canoe for the the first time (if I'd flipped, getting back in without crunching the camera would've been hard), but Howie grabbed it and got some nice shots of me, plus an assortment of shots as he rode back to the dock with Holly in the safety boat (he sailed a Sunfish out, I sailed it back). Click to visit the album. Jim brought his camera along too and he's posted a set on Google Plus. Click here to see those. The winds may not have been ideal, but it was a gorgeous day to be on the water! 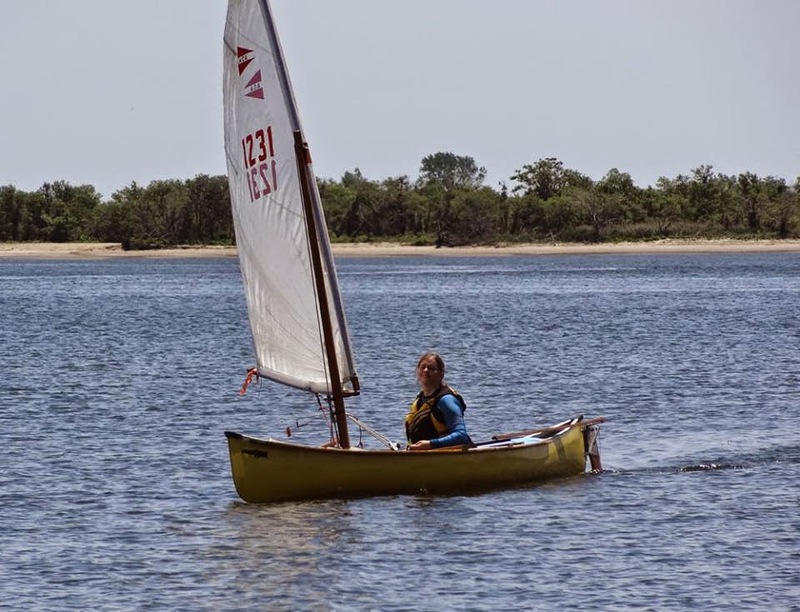 It's good to try something different - here I am sailing a canoe for the first time ever! It was fun. Thanks to Jim Luton for the photo! And what a spectacular weekend it was - I watched a crazy canoe race, I took a nap, I played some Irish music and ate some good food and caught up with some old friends on the roof at my friend John's place, I saw the first firefly of the summer on the way home that night, and then on Sunday I took a canoe sailing workshop at Sebago which was a lot of fun, then did some gardening and then went to TQ's for dinner (he's working weekends but he got out his pressure cooker when he got home and made a fantastic oxtail stew - delicious!). Does a weekend get much better than that? Pictures from both boating events to come. I'm absolutely kicking myself for not bringing a camera to the rooftop session! Looking for something fun and unusual to do this weekend? Why not head to the banks of the lovely lovely Gowanus canal to watch (or if you've got a boat to paddle or row, race in) the 2nd annual Gowanus Challenge, tied only with the City of Water Day Cardboard Canoe Races for the most amusing boat race in NYC. Since this is the one I'm plugging right now, hey, let's call it the most amusing boat race featuring generally non-sinking type boats in NYC! Is the water dirty? Why yes it is. Ask me or most other small recreational craft enthusiast that question about our usual haunts and we'll happily explain that it used to be, but since the Clean Water Act was enacted in 1974 things have gotten much better - but here in the Gowanus, things are still pretty sketchy. Hazmat suits not required, but if you want to bring your own, feel free. er, no, wait, that's the Starship Enterprise. Oops. To assemble and educate a diverse group of individuals, businesses and organizations to improve the Gowanus waterfront in Brooklyn and foster awareness of issues affecting New York- New Jersey harbor...to contribute to transforming a dilapidated, historically significant estuary into a self-sustaining, environmentally friendly and healthy waterfront to be enjoyed and treasured by current and future generations. The 2.5 mile race begins and ends at 2nd Street. Race registration opens at 10, skippers' meeting is at 10:30, the starting gun will be at 11. For full details, click here and then follow the link the race page. Like my pictures? Lots more here! Ah, Joe's, Joe's, Joe's. I nearly cried back when they closed. I had only discovered this incredible shop with the freshest of fresh mozzarella back in the spring of 2012, I'd been a regular customer for just about a year when they closed their doors in spring of 2013, and if I were a person who did a lot of hugging of people at work I would have hugged my boss Karen when she walked up to my desk last fall and said "Guess what, I saw a sign in the window of the M&O Deli on the corner of Thompson and Prince, they're selling Joe's mozzarella." As it was she was highly entertained at the way my face lit up and how I started babbling with glee - "Really? Joe's? No way! That's awesome!" I haven't indulged recently but for some reason (well, for that reason and also that we've just finished our year-end close so there's a good chance that we'll be starting into a slightly more relaxed period at work, including more getting out by 6 if not earlier) I'd been thinking that I should go get some, so when Baydog and I were talking Jersey peaches on Facebook around 6 and he figured out that I was still at work and told me to stop working and go get some smoked mootz, I didn't need any arm twisting to shut down and go. The cheese got pretty badly nibbled on the way home, but only by me, so that's ok. SO happy to be looking forward to another summer of caprese salads -- or was that carp-rese? Lovely day yesterday - unfortunate that we had to cancel our ACA Day Trip Leader workshop due to small sign-up but with TQ working weekends, oh my gosh a day to ourselves is GOLD. We used it well, too, it was a quiet enough day that we decided to go canoeing. Now why would a pair of kayak freaks want to go canoeing? Because that means we can bring the dog. Bella loved it. 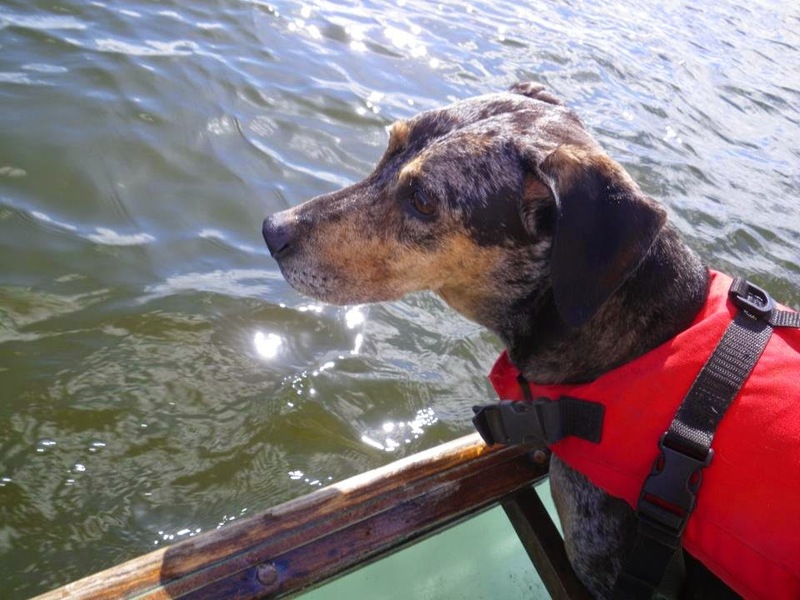 She's got health issues and has slowed way down, but riding along with us in a canoe is a wonderful way for her to enjoy being outside in the fresh air. We'd been worried about her getting too hot out in the sun like that, but the breeze over the still-cool water made things lovely out on the bay. At one point she was sitting with her chin on the gunwale - then she just laid down on the foam padding we'd put in the bottom of the boat for her - I was in the bow so I couldn't really see her but TQ said she was just lying there with an expression of perfect doggy contentment on her face, not even panting, just occasionally raising her nose into the air to sniff the interesting scents (he said the nose went especially happy when the fishing boat went by cleaning their catch). 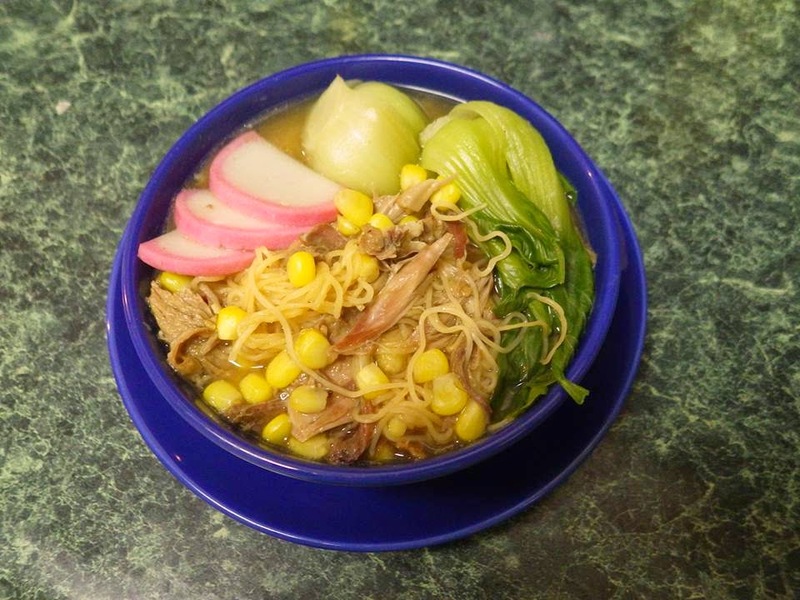 Then back to his place for my turducken ramen (for us) and rawhide chewy bone (for her). This post lifted from today's FB status - haven't had much time for blogging recently, goodness, there was a club pig roast I didn't even mention yet! Sebago's in full swing now. This photo went with my original Weedeater post back in 2008, when I was already a confirmed eater of the "weed" known as lambsquarters, having been eating them since one of our more experienced gardeners told me what they were. I'd taken this picture because I was just cracking up over how much this looked like the work of a child pretend-cooking. I'm bringing it up again today because there's a really good article about the same stuff today on WNYC.org. Sailing season started a month ago with a series of races, but yesterday was our first cruise and my first sail of the season. Lovely conditions; wind was a little light in the morning but I ended up near Holly at one point and she taught me a new trick, inducing heel, so I was actually happy to get that - wind filled in nicely as we rounded end of Ruffle Bar and landed for our lunch break, and the afternoon was great! BTW, the lovely double-ender is Mouse, Jim Luton's newest creation. You can read about her build on Jim's blog,Small Craft Advisory.